Appears to offer benefits in treating panic disorders. Positive effects on depression and obsessive-compulsive disorder. May improve symptoms of hypertension, type 2 diabetes and obesity. Niacin is an essential B vitamin which plays a key role in cerebral and cardiovascular health and which is involved in a multitude of cellular and enzymatic processes. One of niacin's functions in the body is to help eliminate bad' LDL cholesterol and increase good' HDL cholesterol. Its ability to do so has been demonstrated in numerous studies: niacin is the only nutrient to produce a 30% or more increase in HDL, a significant improvement in a key marker of cardiovascular health. Such is the effectiveness of niacin in controlling cholesterol levels, reducing levels of lipoprotein (a) and controlling dyslipidaemia that it has long been used in conventional medicine, despite its extraordinary, if harmless, side-effects (the famous niacin flush', the result of peripheral vasodilation which makes the skin go red a few minutes after taking it). Niacin subsequently gave way to drugs such as statins, which though not totally problem-free when used long-term, had a side-effect profile that was perhaps more commercially-acceptable. 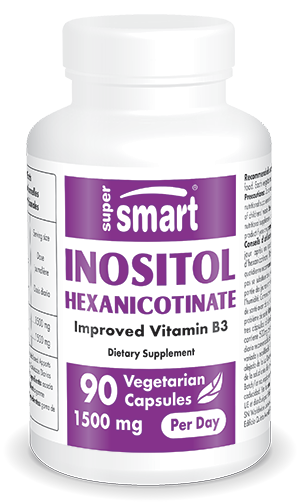 Inositol hexanicotinate or IHN (six molecules of niacin bound to a single molecule of inositol) is the only form of niacin which causes neither redness nor flushes, thus providing all the advantages of higher-dose niacin (500 mg per vegicap) without the flush'. IHN is mainly recommended for lowering LDL cholesterol and raising HDL cholesterol, for reducing triglycerides and as a vasodilator, particularly for peripheral circulation problems. Healthy individuals also take lower doses of IHN for prevention purposes and for the many metabolic benefits associated with niacin supplementation. Each vegetarian capsule contains 500 mg inositol hexanicotinate.